Hello guyz I have developed another major sheet which makes automatic beam schedule. WS BEAM SCHEDULE takes data from ETABS, after calculating and evaluating based on your preferences, it generates reinforcement values. In addition to that it suggest reinforcement bars for final CAD beam schedule, doing all that in seconds without any space for errors. 1) Easy and clean input by selecting a single report file from ETABS. 2) Automatically selects nearest bar dia for main bars, stirrups and side bars. Checks for maximum side bars spacing. 3) User can increase reinforcement or specify minimum reinforcement values. 4) Automatically distributes torsion reinforcement for stirrups, side bars, top and bottom steel . 5) Takes maximum of top reinforcement at end sections of continuing beam spans. 6) User can specify to make top and bottom reinforcement same, top left and top right same, can select minimum bar dia of main and secondary bars etc. 7) Different types of outputs, can print Area required vs Area provided comparison with values and percentages, can print suggested bars with reinforcement values or only the suggested bars for CAD. 8) Takes beam properties from ETABS properties not from beam names so eliminating the error of dimension difference between ETABS and beam schedule. 9) Eliminating any possibility of error in reinforcement values as it takes the exact values from ETABS, calculates, evaluate and present a final reinforcement value including torsion reinforcement. 10) Takes less than 10 seconds to build the schedule and saves more than 70% of time taken to make manual beam schedule from ETABS. Quote: 'WS BEAM SCHEDULE_Help Menu_ver 1.01.zip' is unavailable. This file was deleted. always check this link for any updates.. I am getting the error as shown in the picture below, when I try to run the sheet, please check. The spreadsheet is giving a run-time error 424. This seems to be a referencing error. 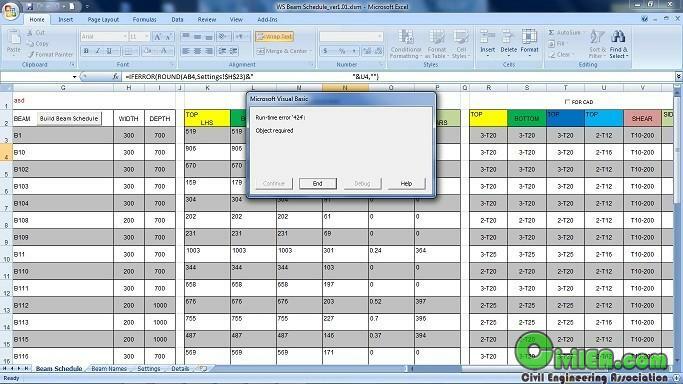 There is a trouble shooting by ms excel site but the procedure is password protected. Dao350.dll or maybe some other file from the dynamic link library.